In September, kokanee-which are a shade of silver most of the year-change to a fluorescent red prior to traveling up rivers and streams to spawn. 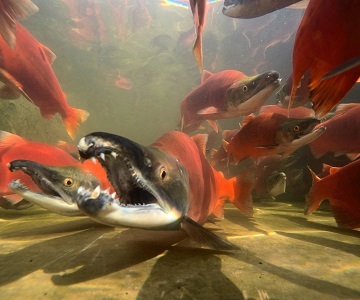 Their bright-red color makes the salmon easy to spot in the waters where they spawn. To celebrate the annual spawn, the Division of Wildlife Resources is holding free viewing events at four locations in Utah. If you'd like to see kokanee on your own, two additional sites are great places to visit. This will be the first year a kokanee salmon viewing event has been held at the Rock Cliff Recreation Area at Jordanelle Reservoir. The event runs from 9 a.m. to 3 p.m. If you attend, you'll see bright-red salmon make their way up the Provo River. The Rock Cliff Recreation Area is on the eastern tip of Jordanelle Reservoir, two miles west of Francis. For more information about either event, call the DWR's Central Region office at 801-491-5678.